Experience the ancient and "mystical" process of dyeing with indigo, a plant-based dye that gives the beautiful shades of indigo blue. For use with all natural fabrics and fibres. 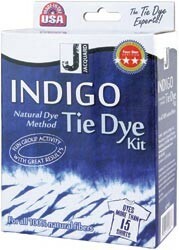 Take tie-dye to the next level, with easy fast results! Recycle, re-use, re-purpose that old white shirt - turn it into one-of-a-kind werable art. Try quirky tie-dye socks, or dye any natural yarn ready to knit a masterpiece. The kit will dye more than 14 metres, or 5 lbs of fabric, or 15 shirts! Contains indigo dye powder (20g), reducing agent (250g), gloves, wood pieces, rubber bands, and instruction booklet with dye patterns and historical & cultural overview of indigo. You will need a 5 gallon bucket with lid, pole or stick for stirring, water and natural fabrics to dye. Use with children only under adult supervision.